The thing about Ninja Golf is that it is easily the most accessible golfing game that I have ever played. There are a basic variety of clubs, a power meter, a shot accuracy meter, and you drag your finger down to hit the ball. As you play the course, you hit the ball several times until it finally goes into the cup at the end. Where Ninja Golf really differentiates itself from literally every other golf game on the market -and in history- is the combat system. 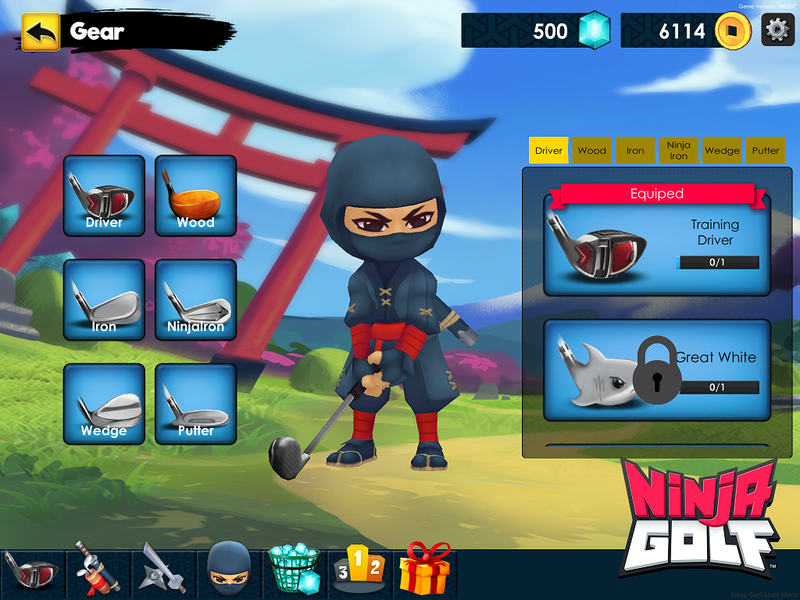 You play as a Ninja who golfs, using a variety of clubs in this free-to-play title. (Image courtesy of Atari). Yes, a combat system. After you hit the golf ball, you then have to run to where the ball lands. 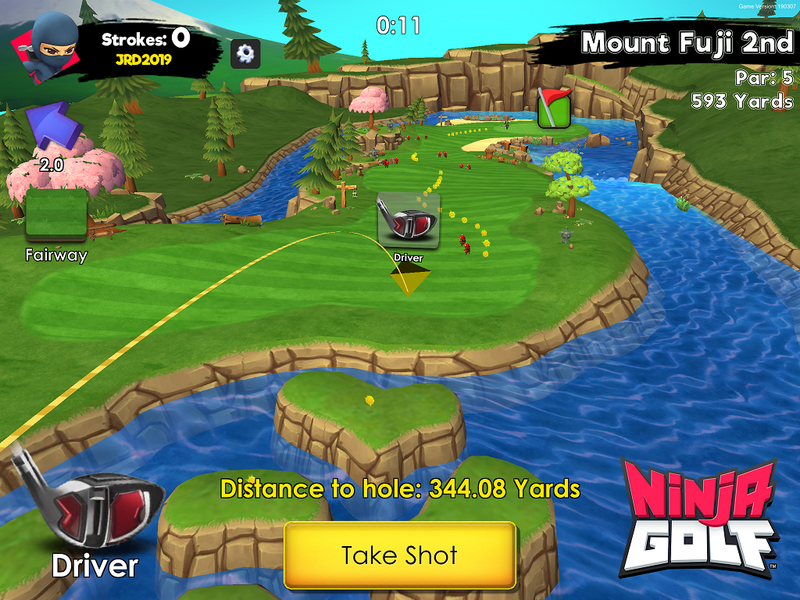 This transitions Ninja Golf from a third person point-of-view game into an open world arena set on a golf course. At that point, you then have to jump and fight your way across the golf course-turned-battlefield through numerous samurai enemies to get to where the ball lays. Along the way, there are numerous coins to collect. If you get hit too much, you will lose. When you get to the ball, Ninja Golf then transitions back to a standard golf game. When you sink the ball into the cup, the game calculates the number of enemies killed, the number of strokes you took and the length of time it took you to complete the relevant link to come up with both a final score and the amount of gold coins you earn. As you run between golf shots, you fight enemies that are scatted on the golf course. (Image courtesy of Atari). 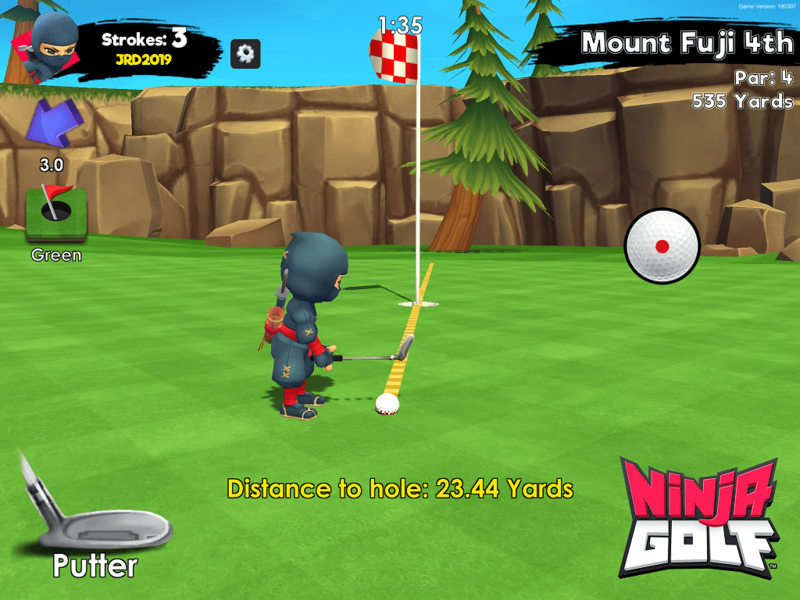 Ninja Golf is one of those hybrid games that you wouldn’t expect to work but does instead to a surprising degree. While the golfing aspect is nowhere as technical as say, Golf Story or Tiger Woods PGA Tour 2005, it definitely is enjoyable in its own right. The combat aspect, while also fairly basic, livens up an otherwise potentially boring (as PVP matches won’t be available until after launch) golf match with action combat and the ability to go pretty much anywhere on the course. My one big issue that I had with Ninja Golf was that I found that the club you use is determined by what kind of ground (rough, green, fairway) that you’re on. For example, if I wanted to use a driver to try to chip the ball in from the rough at a decent distance out, I could not do so as the rough terrain is meant only for a iron club. The lack of choice in choosing what to swing with (you do have variety within each club class to pick from, but you can only use one of each type of club in a match) did drag Ninja Golf down for me. While there are a great many clubs available within each type of club-type (and you can unlock more), you can only have one of each type of club on the course. (Images courtesy of Atari). All that said, though, Ninja Golf is a fun game to play. While I was only able to experience one course during my demo (of which I think I ended up making Par on), I thought it was both gorgeous to look at and a great way to enter into the golfing sub-genre of sports as a beginner without having to stress about things like backspins or making any real sense of the technical differences of club types. The golf and fighting mechanics themselves are quite easy to master as well, though it all comes down to getting the ball in the cup in the fewest number of strokes while killing enemies, and doing both in the shortest amount of time possible. 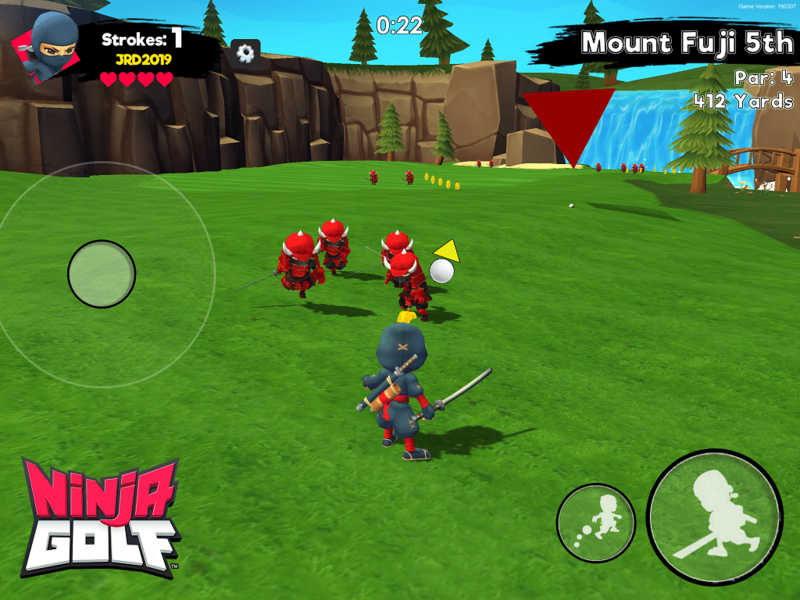 Are you excited to fight off samurai while golfing around in Ninja Golf? Who do you want to take on when PVP is added after launch?